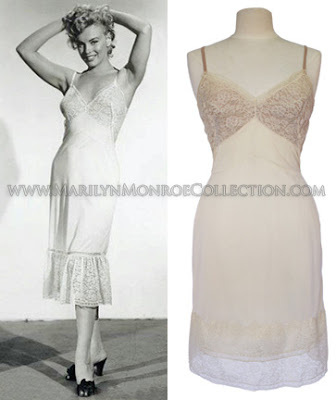 In my recent story, “Monroe Frock Fetches Millions, But Was It THE Dress?” which was about the the Marilyn Monroe Seven Year Itch Dress auction, I touched on some inconsistencies between the Billy Travilla designed halter dress that Marilyn Monroe wore in the 1955 classic, The Seven Year Itch, and the Debbie Reynolds owned Monroe costume that recently sold at the Profiles in History auction. 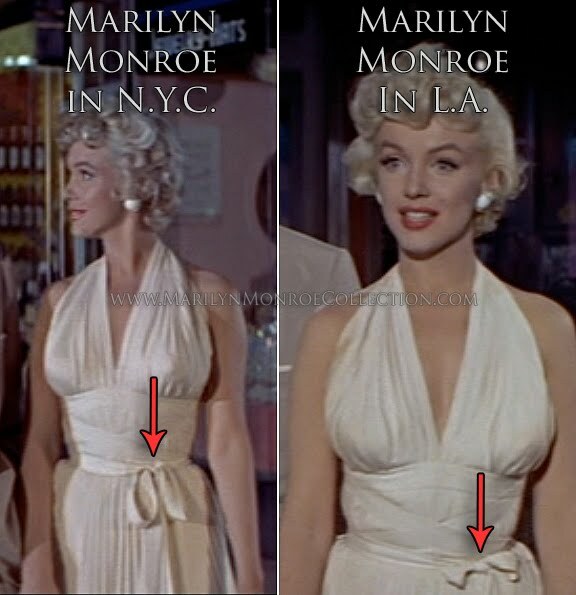 The issues I referenced included variances in the belt and bow, the hem, the length and fullness of the skirt, and most notably the pleating variances between the Reynolds dress and the dress worn by Monroe. I noted also in my recent story that an original Travilla subway scene dress was worn by actress Roxanne Arlen in the in the 1962 film Bachelor Flat. In this film, while the dress is clearly a Travilla design from “Itch,” there are notable differences between Marilyn’s dress and Arlen’s dress, specifically, there is a bow attached to the back of the dress, Arlen wears a brooch on the left side of her waist, and Arlen’s dress is shorter in length than Marilyn’s costume. 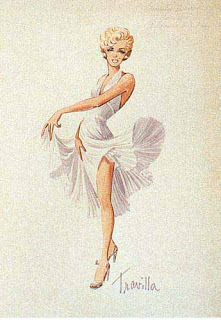 With the help of Andrew Hansford of the Travilla Estate and other industry experts, in this post I provide my opinion, along with photo evidence, as to the origins of the Debbie Reynolds dress. 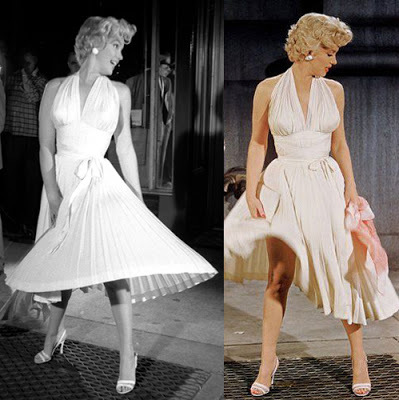 I also present a bit of intriguing information as to the possibility of there actually being TWO DIFFERENT Travilla costumes worn in the now famous skirt blowing scene from The Seven Year Itch. 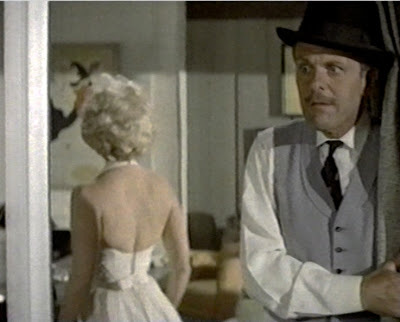 In Bachelor Flat, Arlen’s costume has a bow in the lower back area, shown in the screen capture above. The photo below shows evidence of stitching on the rear of the dress sold by Reynolds in the same location as the placement of the bow on Arlen’s costume. These stitches would be the same threads used to affix the belt to Arlen’s costume. This photo of the back of the Reynolds dress was provided directly by Profiles in History for this story. Thanks to Greg Schreiner for his expertise on this aspect of the Reynolds costume. Arlen wears a brooch on the left side of her waist in the film. 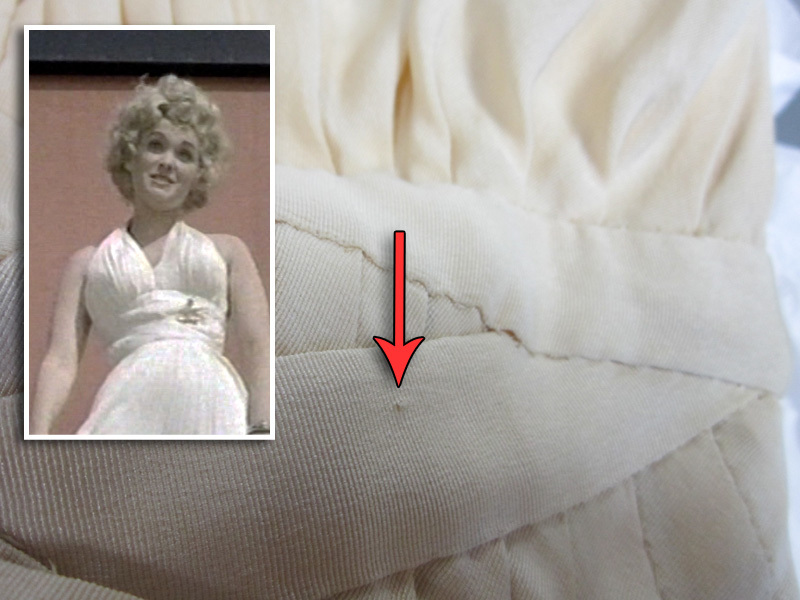 The three photos below show a hole in the fabric of the dress sold by Reynolds, which is in the same location as the brooch worn by Arlen in the film. This hole in the fabric of the Reynolds dress would be the same hole made by the pin of the brooch on Arlen’s costume. The first photo of the dress was taken by Profiles In History for the auction catalog. 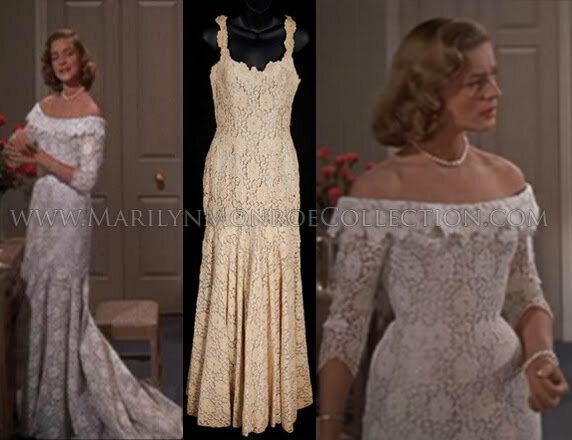 The second photo of the dress was provided directly by Profiles in History for this story, and the third photo of the dress was taken while the dress was on exhibit at the Paley Center prior to the auction on June 18. All three photos, as indicated by the red arrow, show the pinhole. Thanks to Greg Schreiner for providing input on this aspect of the film costume. To begin with, it’s important to note that it was quite common for costumes to be altered and then reused in subsequent film productions. Two examples below show that Lauren Bacall’s wedding dress from How To Marry A Millionaire was altered, and even Marilyn’s slip from Niagara was modified for use in another film. In the photo comparison below, it’s clear that the dress worn by Arlen and the dress worn by Monroe were different lengths. Arlen’s dress comes to just below the knee (note her knees are actually bent slightly in this image), while Monroe’s is clearly well below the knee. As a point of reference, Roxanne’s height is reported as 5’ 7” and Marilyn’s height was 5’5 ½”, a mere 1 ½” variance. 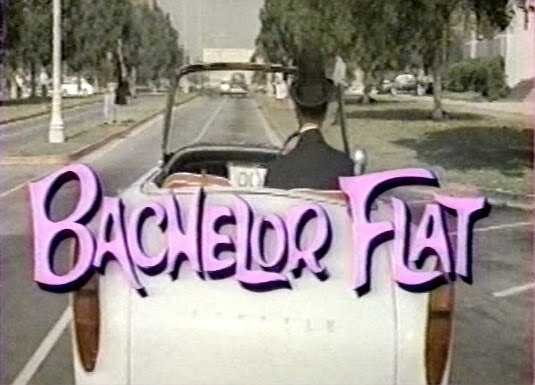 Seeing as how Bachelor Flat was considered a “B” movie, with Arlen playing a secondary character, it’s very likely that a costume was pulled from the studio closets and then altered for her to wear in the film (as compared to creating an exact replica of Marilyn’s “Itch” costume). The photo below shows the inside of the Reynolds costume, specifically the fabrics of the skirt, which are irregular and unfinished, likely a result of the alterations made to shorten the skirt. 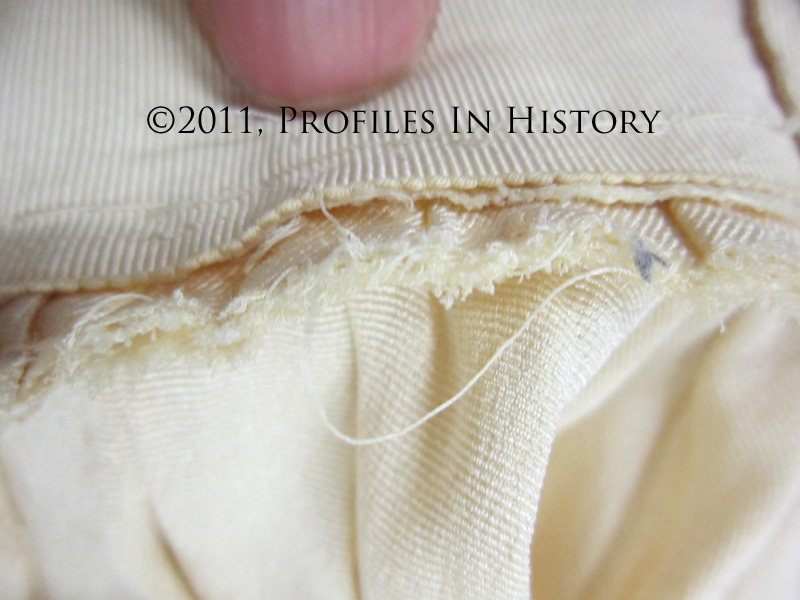 This photo of the inside of the Reynolds dress was provided directly by Profiles in History for this story. 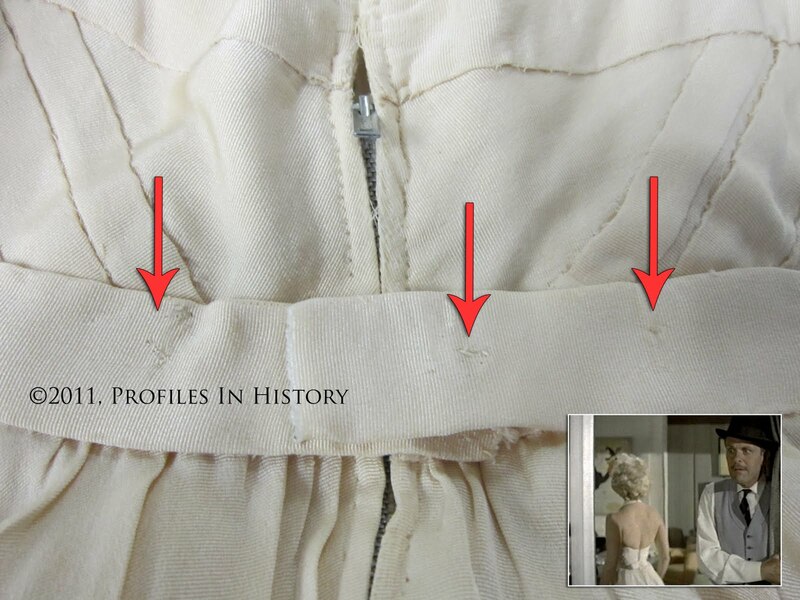 In summary, there are stitching remnants on the back of the Reynolds dress in the same location as the bow on the dress worn by Arlen, there is a hole in the Reynolds dress in the same location as the brooch worn by Arlen in the film (and the hole is evident in many different photos of the dress taken before and after the auction), and there is solid evidence that the skirt of the Reynolds dress was altered, likely for Arlen to wear in Bachelor Flat, which would explain the variances in pleats and the length of the skirt when compared to photos of Monroe’s costume in The Seven Year Itch. 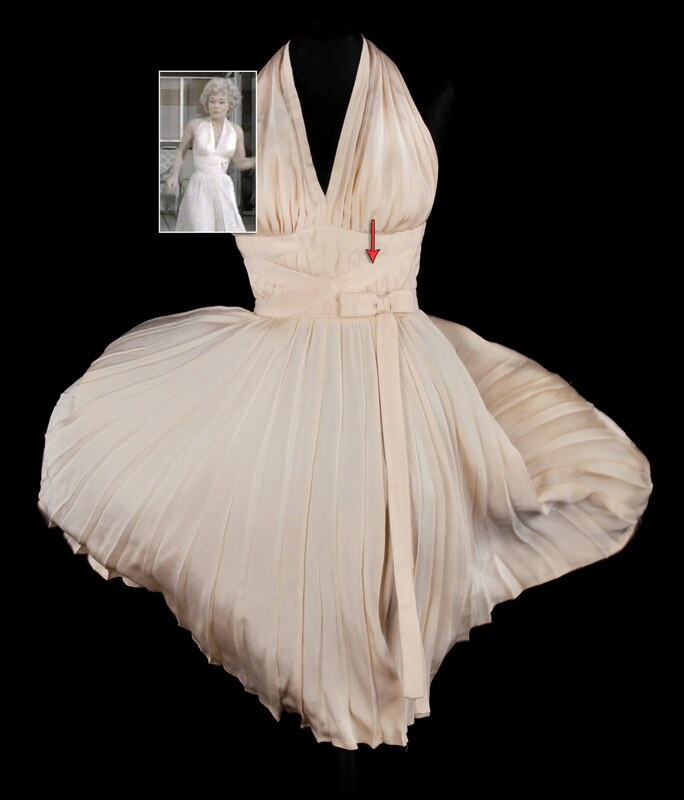 Accordingly, it can plausibly be concluded that the Debbie Reynolds Seven Year Itch dress sold at the Profiles In History auction on Saturday, June 18, was without question acquired by Ms. Reynolds directly from Fox studios, seeing as it’s the same dress worn by Arlen in Bachelor Flat. While it’s my opinion that the dress sold at auction came from Twentieth-Century Fox, we must rely on the taped audio recordings of Oscar winning costume designer William “Billy” Travilla himself as to whether or not the Reynolds owned Marilyn Monroe costume was actually the dress worn in The Seven Year Itch. 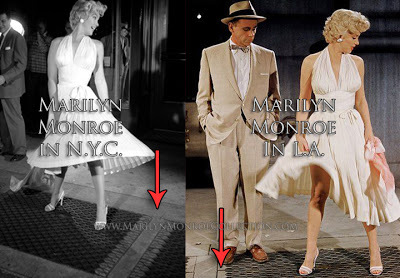 As reported in my recent story, the now famous subway skirt blowing scene from The Seven Year Itch was originally shot on location in New York City. Unfortunately, there were so many people in attendance at the filming (media and general public) that the footage couldn’t be used due to all of the noise from the crowd. 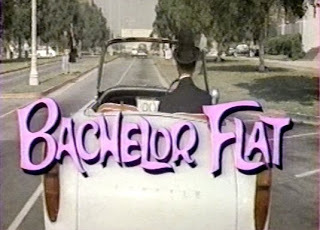 It’s not a well known fact that the subway skirt blowing scene was actually re-shot on the Fox lot back in Los Angeles (Hollywood). First, it’s important to establish the New York City location and the Hollywood Location. Note the differences in the scenes below. On the left is the New York City location, and the Los Angeles set is on the right. 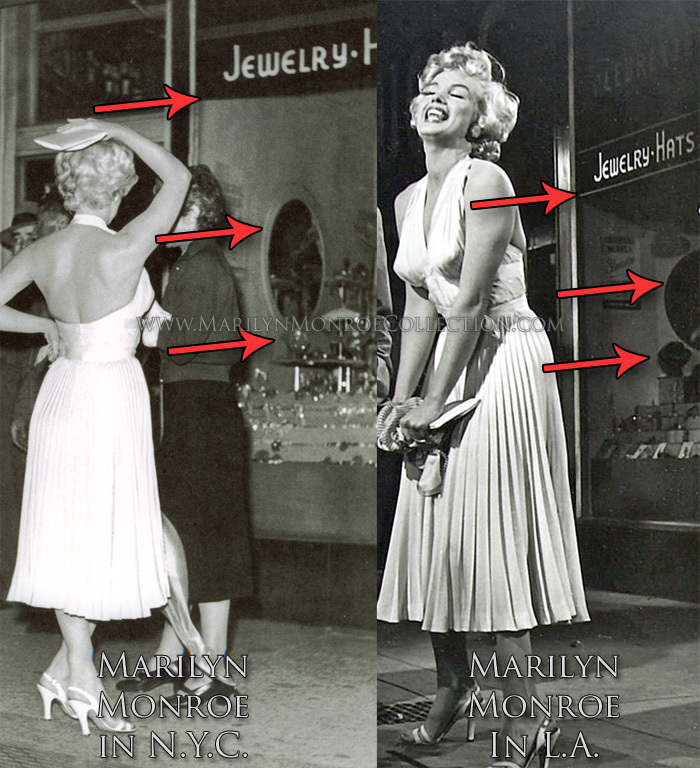 Note the differences between the “Jewelry – Hats” signs, the mirrors on the wall, and the items for sale in the jewelry store window. Second, in the photo below, note the differences in the pavement around the subway grates. There are subtle differences between the two locations, with New York being on the left, and Los Angeles on the right. Third, notice the differences in Marilyn’s hair, and the belt on her costumes in the images below. Finally, as stated previously, it’s been reported that the footage shot in New York City couldn’t be used due to the large number of people (media and general public) in attendance at the taping. The crowd roared each time Marilyn’s dress blew above her head, hence rendering the footage unusable, or at least that’s what has always been reported and believed. As part of my research into the Reynolds costume, I discovered that the full subway skirt blowing scene actually includes footage shot in New York City and on the Fox lot at the studio in Los Angeles. Incredibly, I’d never picked up on the differences previously. The images below, taken directly from the film, verify that indeed footage from both locations was used in the final production. Marilyn’s skirt blows up twice. The location splice occurs between the “skirt blowings,” once in New York and once in Los Angels, implying that technically, there are TWO skirt blowing costumes. View the subway scene from the movie on YouTube.com here. The subway scene is the first two minutes of the clip. 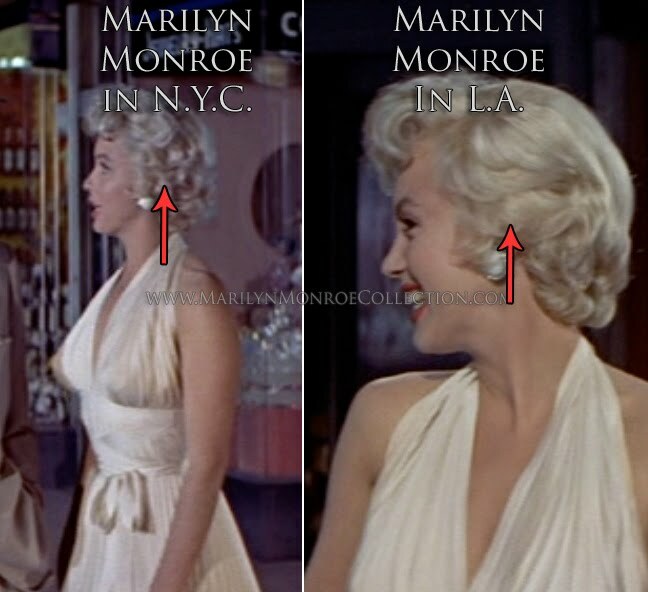 Research I’ve conducted indicates the New York City location filming occurred on September 15, 1954, and the Los Angeles location filming occurred on January 9, 1955. This is an important fact because it signifies that there were very possibly TWO separate dresses used in the filming of this one scene. The New York location filming occurred from approximately 12:00 to 3:00 AM. 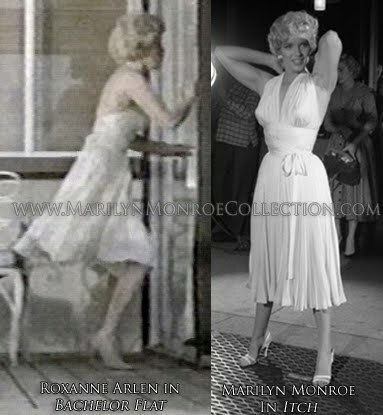 Considering the hours of filming, it’s very likely that Marilyn departed (and possibly arrived) wearing the costume for this scene. The image below shows Marilyn wearing the subway scene dress, along with her mink fur coat. Was she arriving for or departing from shooting the subway scene? With the information presented in the previous paragraph, it’s critical to note that the storage facility containing the personal effects of Marilyn Monroe (after having been bequeathed to Lee and Paula Strasberg) was burglarized in 1993, and a number of Marilyn Monroe’s personal effects were stolen, including a white subway scene dress worn by Marilyn Monroe in The Seven Year Itch. The burglar was apprehended in 1994 and all of the items were returned…except for the white dress. For a news post from 1994 about the recovery of the stolen items, click here. 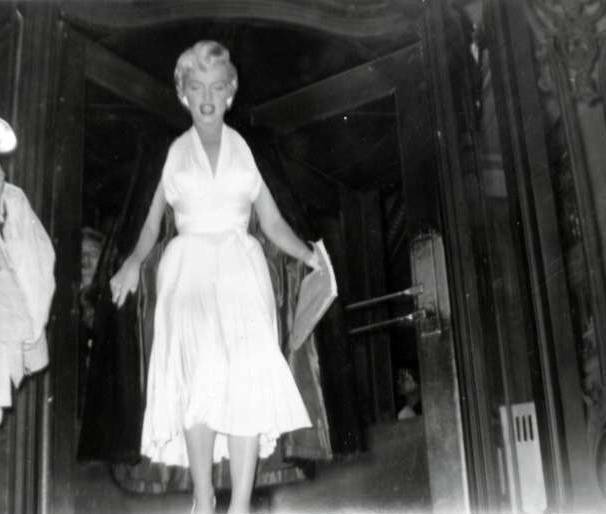 It’s clear that subway scene footage from New York and Los Angeles was used in the final cut of The Seven Year Itch. Also, there is documented evidence that Marilyn actually had a subway scene dress in her possession at the time of her death. 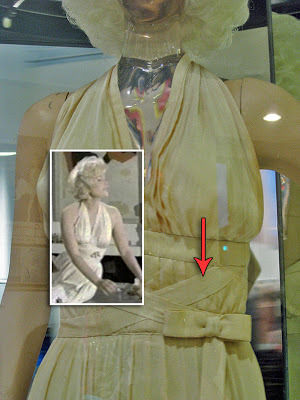 If the New York taping occurred on September 15, 1954, and the Los Angeles taping occurred on January 9, 1955, nearly four months later, and on different coasts of the United States, what are the chances that the same dress was used for both tapings, especially considering the extreme possibility that Marilyn may have worn the dress off of the New York film set? Were there TWO subway scene dresses? Also, if four duplicate dresses were created for “Itch,” (as detailed in Travilla’s notes) where are the other two costumes? ← Update: Was it THE dress? Why was the full history of the item not disclosed before the auction? Was it intentional or just sloppy work? Don't potential buyers deserve the full background of the item BEFORE they bid? I don't think anyone really doubts Ms. Reynolds word, but doesn't the auction house have a responsibility of full disclosure to their clients? The final image to the right looks like it has the larger pleats but…who knows?! like so many aspects of marilyns life we will probably never know the truth.. I knew about the crowd noise at the New York Trans Lux Theater location ruining the filming. But I'm really impressed with all the research you did to discover the differences in the Hollywood vs. NYC locations. Great job. I agree with kgharris… the pleats on the LA dress don't look as "tight" as the pleats look in the NY footage. I think they are 2 different dresses. And… I fully agree with piratedoggie. I would be pretty mad if I'd paid over $5,000,000 for a dress whose background, come to find out, is shrouded in mystery. Refund. Wow! Boy, am I glad I didn't drop 5 superlarge down when there are possibly 3 other dresses out there; this creates all kinds of hassles. How would you even describe the dress if loaning it out to a museum, when you thought it was the only one? And even worse, who's going to buy it knowing it's imperiled history? An unfortunate deal all around. Excellent research I give you tremendous credit. It makes alot of sense Debbie has an authentic copy that was altered later, much like the history of Marilyn's Some Like it Hot dress with the heart shaped hole in the fanny was later alterd. Somewhere I have the article that mentions Marilyn had a copy that was stolen from Strasbergs' storage Unit. If it was recovered maybe it wasn't included in the big sale or possibly was beyond repair since the storage unit reportedly sustained water damage over the decades, ruining some items. The dress has been copied so often for every Marilyn tv movie so who knows. Debbie copy never did look right on that horrible mannequin. I say good for Debbie either way she has been taken enough in life she deserves respect.